Go to original pattern for design DROPS 175-30. DROPS HOOK SIZE 3.5 mm - or size needed to get 21 trebles x 12 rows = 10 cm in width and 10 cm vertically. See diagrams A.1 to A.6. 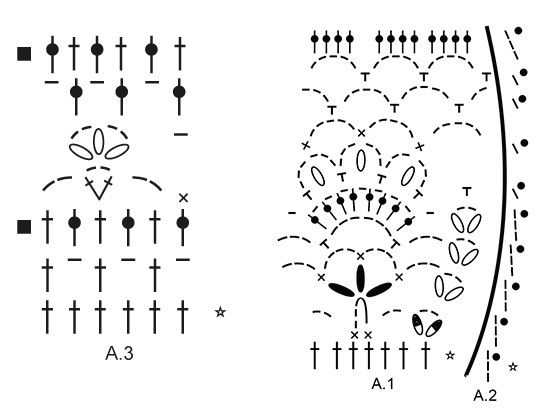 A.2 shows how round begins and ends when working A.1 (A.2 is an addition to A.1, i.e A.2 replaces 1st stitch). 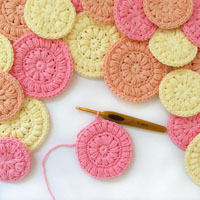 Begin every round with trebles with 3 chain stitches ,finish round with 1 slip stitch in 3rd chain stitch at beginning of round. Begin every round with double crochet with 1 chain stitch, finish round with 1 slip stitch in 1st chain stitch at beginning of round. 2nd and 5th round in A.3 begins with 3 chain stitches, finish round with 1 slip stitch in 3rd chain stitch at beginning of round. Work A.3. When A.3 has been worked 1 time vertically, work 5-6-8-9-10-11 rounds with 1 treble in every treble, then work A.3 one more time. 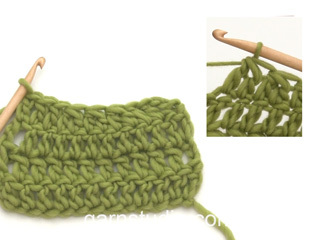 To calculate how to increase/decrease evenly, use the total number of stitches on row (e.g. 258 stitches) and divide stitches by number of increases/decreases to be done (e.g. 15) = 17.2. In this example increase after approx. every 17th stitch. If decrease, crochet approx. every 16th and 17th stitch together. Increase 1 treble by working 2 trebles in same stitch. Work until 2 trebles/chain stitches remain before marker thread, work 2 trebles in/around next treble/chain stitch (= 1 treble increased), work 1 treble in/around each of the next 2 treble/chain stitches, marker thread is in the middle of these trebles/chain stitches, work 2 trebles in/around next treble/chain stitch (= 1 treble increased). Repeat increase at every marker thread. Decrease 1 treble by working the next 2 trebles together as follows: Work 1 treble but wait with last pull through (= 2 loops on hook), then work next treble but on last pull through, pull yarn through all 3 loops on hook. Worked in the round from mid back, top down. insert 1 marker thread, work 42-42-44-44-46-46 trebles and increase 0-1-1-2-1-1 trebles evenly, insert 1 marker thread, work 4 trebles and increase 2-4-4-4-4-4 trebles evenly, insert 1 marker thread (= sleeve), work 58-58-62-62-66-66 trebles and increase 0-0-0-2-0-0 trebles evenly, insert 1 marker thread, work 4 trebles and increase 1-4-4-4-4-4 trebles evenly, insert 1 marker thread (= front piece), work 42-42-44-44-46-46 trebles and increase 0-1-1-2-1-1 trebles evenly, insert 1 marker thread, work 4 trebles and increase 1-4-4-4-4-4 trebles evenly, insert 1 marker thread (= sleeve), work 29-29-31-31-33-33 trebles and increase 0-0-0-1-0-0 trebles evenly(= left back piece) = 222-234-246-252-258-258 trebles on round. Piece measures approx. 9 cm. Work 0-0-0-0-2-2 rounds with 1 treble in every treble and increase 0-0-0-0-12-15 trebles evenly on each of the rounds – READ INCREASE/DECREASE TIP (= 0-0-0-0-24-30 trebles in total) = 222-234-246-252-282-288 trebles. Move marker threads upwards when working. Repeat A.3 37-39-41-42-47-48 times in total in width. On 2nd round (i.e. round with trebles) increase at every marker thread – READ INCREASE TIP-2 and increase 2-8-8-8-8-8 trebles evenly on round (= 2 trebles increased at every marker thread and 2-8-8-8-8-8 trebles increase evenly = 18-24-24-24-24-24 trebles increased on round) = 240-258-270-276-306-312 trebles. Now repeat A.3 40-43-45-46-51-52 times in width. Repeat increase on last round in A.3 (i.e. 2 trebles increased at every marker thread and 2-8-8-8-8-8 trebles increased evenly = 18-24-24-24-24-24 trebles increased in total on round) = 258-282-294-300-330-336 trebles. * Work 1 round trebles with 1 treble in every treble. Work 1 round trebles and increase 18-18-16-17-24-26 trebles evenly *, repeat from *-* 1-1-2-3-2-3 times in total = 276-300-326-351-378-414 trebles. Work 0-1-1-0-1-0 rounds trebles with 1 treble in every treble. Piece measures approx. 17-18-19-20-21-22 cm. On next round work as follows: Work 1 treble in each of the first 39-43-47-51-57-64 trebles (= half back piece), work 8 chain stitches, skip 60-64-69-73-75-79 trebles from previous round (= sleeve), 1 treble in each of the next 78-86-94-103-114-128 trebles (= front piece), 8 chain stitches, skip 60-64-69-73-75-79 trebles from previous round (= sleeve), 1 treble in each of the last 39-43-47-51-57-64 trebles (= half back piece) = 172-188-204-221-244-272 trebles/chain stitches on round. Finish body and sleeves separately. Insert 1 marker on round – NOW MEASURE PIECE FROM HERE. Work 1 round trebles with 1 treble in every treble/chain stitch. Work 1 round more with 1 treble in every treble and decrease AT THE SAME TIME 4-2-0-5-4-2 trebles evenly – READ INCREASE/DECREASE TIP and DECREASE TIP = 168-186-204-216-240-270 trebles. Now work PATTERN-1 - see explanation above. AT THE SAME TIME when piece measures 9-10-11-12-13-14 cm, adjust so that next round is a round with trebles, decrease 6-12-12-6-6-6 trebles evenly = 162-174-192-210-234-264 trebles. Continue pattern-1. When piece measures 19-20-21-22-23-24 cm, increase 6 trebles evenly - READ INCREASE/DECREASE TIP AND INCREASE TIP-1. Increase like this every 3rd round 12-12-12-12-14-14 times in total = 234-246-264-282-318-348 trebles. When piece measures 49-51-53-55-57-59 cm from marker (entire dress measures approx. 71-74-77-80-83-86 cm), work A.3 in the round. When A.3 has been worked, work 1 round trebles with 1 treble in every treble. Then work 1 round double crochet with 1 double crochet in every treble. Fasten off. Dress measures approx. 76-79-82-85-88-91 cm from shoulder and down. Sleeve is worked in the round, top down. Beg by working mid under sleeve as follows: Work 1 double crochet in the 5th chain stitch of the 8 chain stitches worked in armhole on body, work 3 chain stitches, work 1 treble in each of the next 3 chain stitches, work 1 treble in every treble over sleeve, work 1 treble in each of the remaining chain stitches under sleeve = 68-72-77-81-83-87 trebles on round. Insert 1 marker mid under sleeve – NOW MEASURE PIECE FROM HERE. Work 1 round trebles with 1 treble in every treble and decrease AT THE SAME TIME 2-0 trebles evenly = 66-72 trebles. Work 1 round trebles with 1 treble in every treble and increase AT THE SAME TIME 1-3-1-3 trebles evenly = 78-84-84-90 trebles. = 66-72-78-84-84-90 trebles. Work trebles in the round with 1 treble in every treble until piece measures approx. 3 cm from marker in all sizes. Now work A.3 in the round. When A.3 has been worked, work 1 round trebles with 1 treble in every treble. Then work 1 round double crochet with 1 double crochet in every treble. Fasten off. Work the other sleeve the same way. Worked back and forth from mid back - NOTE: Work in the chain stitches where trebles were worked, but do not work in the chain stitches skipped = 126-126-133-133-140-140 trebles). Work 1 double crochet in each of the first 16-16-18-18-20-20 stitches, * 1 half treble in each of the next 3 stitches, 1 treble in each of the next 3 stitches, 1 double treble in each of the next 19 stitches, 1 treble in each of the next 3 stitches, 1 half treble in each of the next 3 stitches *, 1 double crochet in each of the next 32-32-35-35-38-38 stitches, repeat from *-* 1 time and then work 1 double crochet in each of the last 16-16-18-18-20-20 stitches. Work next round as follows: Work 1 double crochet in each of the first 20-20-22-22-24-24 stitches, ** 1 half treble in each of the next 3 stitches, 1 treble in each of the next 3 stitches, * work the next 2 double trebles together *, repeat from *-* 5 more times, 1 treble in each of the next 3 stitches, 1 half treble in each of the next 3 stitches **, 1 double crochet in each of the next 38-38-41-41-44-44 stitches, repeat from **-** 1 more times and finish with 1 double crochet in each of the last 20-20-22-22-24-24 stitches = 114-114-121-121-128-128 stitches. Work 1 round with 1 double crochet in every stitch. Fasten off. Hallo! Ich scheitere schon daran die passende Größe zu finden, da die Angaben der Maßskizze identisch sind, egal ob man cm oder inches auswählt. Dabei kann dies nicht möglich sein. 1cm ist nunmal nicht 1 inch. Beste Grüße! Liebe Julia, alle Maßen in der Skizze sind in cm - hier lesen Sie mehr über die Grössen. Viel Spaß beim häkeln! Bonjour Mme Aubry, en taille S, vous crochetez 146 ml (chaque nombre se réfère à la taille dans l'ordre indiqué, vous suivrez ainsi à chaque fois le 1er nombre). 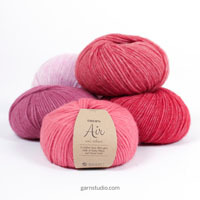 Au premier tour, vous crochetez ainsi: 3 mailles en l'air, 1 bride dans chacune des 5 mailles en l'air suivantes, *sauter 1 maille en l'air, 1 bride dans chacune des 6 mailles en l'air suivantes*, répéter de *-* tout le tour = 126 brides. Bon crochet! Bonjour Virginie, vous trouverez la quantité nécessaire ainsi que le crochet et l'échantillon sous l'en-tête, soit 500 g DROPS Safran / 50 g la pelote = 10 pelotes en taille S. Bon crochet! How can I buy the subscription of your magazine ? Where can I buy it? I prefer to have every issue on paper. Thank you! Dear Snowie, there are no subscription required, you can print all our online pattern for free. Happy crocheting! Bonjour. au début, il est indiqué : "Voir digrammes A1 à A6" .... mais je ne vois que 3 diagrammes, A3, A1 et A2. Merci de me dire où je peux trouver les autres. Cordialement. Bonjour Mme Hochet, merci pour votre retour, il n'y a effectivement pas autant de diagrammes, il fallait lire "A.1 à A.3), la correction a été faite, merci. Bon crochet! Bonsoir. Pour l'empiècement je ne comprends pas quand il faut crocheter 4 brides en augmentant 4 brides à intervalles réguliers. Est-ce qu'il faut faire les 4 brides et les 4 augmentation dans le même arceaux? 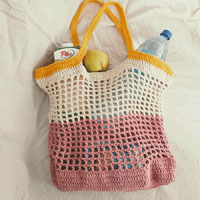 Bonjour Kelly, pour augmenter, vous allez crocheter 1 bride supplémentaire autour d'un arceau (vous aurez donc parfois 5 brides au lieu de 4 pour le devant, dos et/ou manches), pour augmenter 4 brides en crochetant 4 brides, crochetez 8 brides autour de l'arceau. Bon crochet! Bonjour Anaïs, vous trouverez en bas des explications un schéma avec toutes les mesures pour chaque taille. Comparez ces mesures à celles d'un vêtement analogue que vous avez et dont vous aimez la forme pour trouver la taille idéale. Vous trouverez plus d'infos sur les tailles ici. Bon tricot! Buongiorno Alessandran. Indica il numero di maglie a seconda della taglia. Quindi per la taglia S e M, 1 maglia alta in ognuna delle 5 catenelle successive, nelle taglie L e XL non lavora maglie alte, nelle ultime due taglie lavora 1 maglia alta nella catenella successiva. Buon lavoro!